It's time to introduce you to another one of Our Friday Friends! As I was surfing through the Taylored Expressions Gallery at SCS admiring all of the beautiful creations I came across a cupcake card (featuring For the Love of Cupcakes) that wowed me with it's Shimmerz frosting (you can view it by clicking here and while you're there you might want to leave a little love!) That card was created by Melissa Sauls (Melissa_Aggie on SCS.) We are excited to have Melissa as our Friday Friend and she has another super yummy creation to share with us today. This card features Berries & Cherries and uses the sketch challenge Taylor has posted on her blog today - TESC78. We also thought you'd enjoy getting to know a little about Melissa so we asked her a few questions. I first became addicted to papercrafts when I attended my first “stamping” party about this time 5 years ago. My friend that had invited me told me we’d be going to a “stamp party” (and in my mind, I’m thinking postage stamps) and she went on and on about how great it was and how we could put stamps on the walls, etc. She really had to talk me into going because I just wasn’t sold on putting postage stamps on my walls! LOL! Needless to say, I was sold after that first party….and pleasantly surprised to not see any fun things to do with postage stamps! How would you describe your style? What are your favorite projects to create? I swear, my style changes from week to week! I peruse sooo many blogs of all you wonderful ladies out there and I’ll get an idea and go with it. Most of the time though, my style is pretty clean with a lot of straight lines. I guess that’s the Engineer in me, haha! My favorite projects to create are 3D items that are created from a simple piece of cardstock. I always find it so amazing that something so cute and fabulous can be made from a simple piece of cardstock. No matter what it makes, I’m always thrilled with the results! Do you have a favorite TE image? Such a hard question because this changes with every release! I absolutely adore the new Berries & Cherries stamp set, but I also just love the super cute images from Beary Special. Anything with chocolate and peanut butter. Like, peanut butter cups…cookies…ice cream...mmmMMMMm! 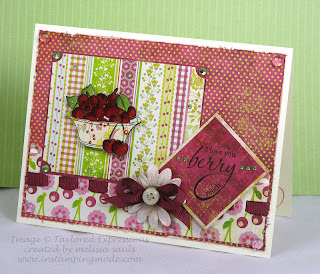 Melissa has also created another card for today's sketch and you can see that one of her blog In Stamping Mode. Thank you Melissa for being Our Friday Friend!! How about you? Would you like to be Our Friday Friend? We'd love to have you and to be considered all you have to do is upload your creations featuring TE stamps to the SCS gallery and use keyword tayloredexpressions (all one word, no space.) We'll be watching for you! Yea!! I am happy to say I know Melissa IRL and the woman just WOWS you with her humble, sweet nature and serious stamping skills!! I always LOVED doing her shoebox swaps at our upline's house and miss it.